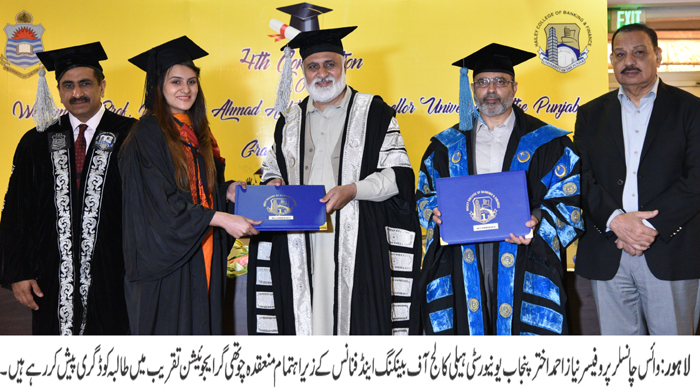 LAHORE: (Wednesday, April 3, 2019): Punjab University Vice Chancellor Prof Niaz Ahmad has urged the students to improve quality of service in banking and insurance sector and introduce innovations in their fields. He was addressing the 4th graduating of PU Hailey College of Banking & Finance (HCBF) at Pearl Continental Hotel here on Wednesday. HCBF Principal Prof Dr Mubbsher Munawar Khan, Registrar Dr Muhammad Khalid Khan, Member Senate Raja Munawar, senior faculty members and a large number of students were present on the occasion. Addressing the ceremony, Prof Niaz Ahmad said that every challenge was an opportunity for students. He said that now the students were international citizens and they have competition with students of all the countries. He said that the students must work with honesty and remain loyal to their organizations. He said that it was really appreciated that the college was imparting market-oriented education and equipping its students with skills according to their career. He congratulated the students and their parents for completing their degrees from the oldest and most prestigious institution of the country. In his address, Prof Dr Mubbsher Munawar Khan presented the efforts undertaken by the college management in adding to the profile of the institution. He briefed in detail about the efforts undertaken for promoting research culture in the institution. His speech highlighted accomplishments of the international conference organized by HCBF and attended by Academicians across the globe. He appreciated response of the students in these academic programs opening new vistas of knowledge and research. He also briefed the development plans to increase infrastructure of the institution serving as nursery for the financial sector and corporate world. He specifically mentioned the outcome of motivational drive to enhance academic profile of the faculty. He congratulated the recipients of awards and degrees and advised them to add to the knowledge base by their experiences and contribute positively in review of curriculum based on their learning experiences. In the ceremony, 319 graduates of MBA Banking and Finance and MBA Insurance and Risk Management of academic sessions including 2012-2016, 2013-2017 and 2014, 2018 were awarded degrees and medals.